Lever, first and second gear R.L. Lever, third and fourth gear R.L. First and second gear R.L. Switch rod third and fourth ga.
Switch third and fourth. Aisle R.L. Shift rod, reverse gear R.L. Lever first and second gear R.L. 1 F 26 052 Rear carrier a.A. a.A.
0 F 26 054 Rear carrier R.L. a.A. a.A.
5 F 26 055 Carrier in front a.A. a.A.
0 F 26 057 Carrier in front a.A. a.A.
0 F 26 059 Front carrier R.L. a.A. a.A.
0 F 26 060 Front carrier R.L. a.A. a.A.
0 F 26 063 Lever, first and second gear R.L. a.A. a.A.
7 F 26 064 Lever, third and fourth gear a.A. a.A.
0 F 26 066 Lever, third and fourth gear R.L. a.A. a.A.
8 F 26 067 levers a.A. a.A.
10 F 26 069 levers a.A. a.A.
11 D 27 225 guiding a.A. a.A.
0 F 26 072 Scenery R.L. a.A. a.A.
0 G 82 429 Screw, ground connection a.A. a.A.
24 F 26 073 switching tube a.A. a.A.
0 F 26 075 switching tube a.A. a.A.
0 F 26 077 Switch tube R.L. a.A. a.A.
0 F 26 078 Switch tube R.L. a.A. a.A.
26 D 27 365 Eye bolt (a.Schaltr.f.Ganganz.) a.A. a.A.
0 F 26 079 Screw R.L. a.A. a.A.
0 F 26 080 Shift lever R.L. a.A. a.A.
36 D 26 451 clamping sleeve a.A. a.A.
0 D 26 506 clamping sleeve a.A. a.A.
38 D 26 444 pilot pin a.A. a.A.
0 F 26 082 Reverse gear lever R.L. a.A. a.A.
45 D 26 459 Intermediate lever (1st and 2nd gear) a.A. a.A.
0 D 26 461 Lever (3rd and 4th gear) a.A. a.A.
R50 D 27 237 Intermediate shaft R.L. a.A. a.A.
R51 F 26 083 Housing R.L. a.A. a.A.
R53 D 27 242 Ball R.L. a.A. a.A.
R54 C 26 222 flat washer a.A. a.A.
R55 D 27 243 Sealing ring R.L. a.A. a.A.
R59 D 27 244 Spacer ring R.L. a.A. a.A.
R60 F 26 084 Lever R.L. a.A. a.A.
R61 F 26 085 Lever R.L. a.A. a.A.
R64 F 26 086 Holder R.L. a.A. a.A.
R66 F 26 087 Lever R.L. 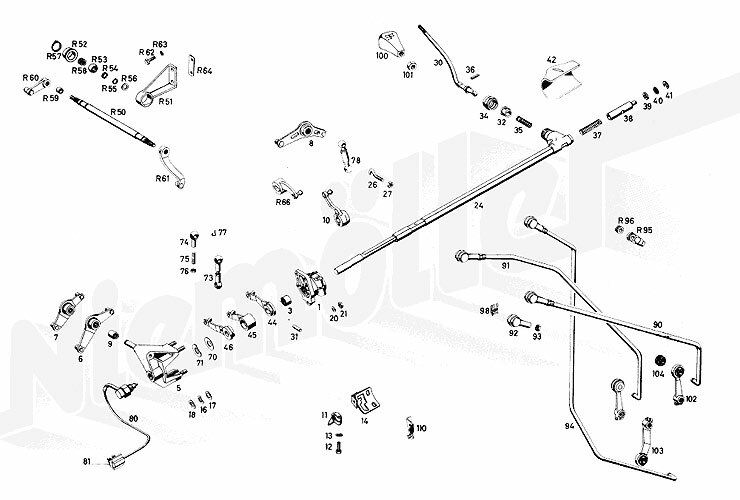 a.A. a.A.
71 D 26 465 spring plate a.A. a.A.
73 F 26 088 pull rod a.A. a.A.
0 F 26 089 Tie rod R.L. a.A. a.A.
74 D 26 361 ball socket a.A. a.A.
76 G 97 106 Nut Holder on fairing Wheel mounting a.A. a.A.
77 D 26 362 safety catches a.A. a.A.
78 F 26 090 ball socket a.A. a.A.
81 D 26 475 male a.A. a.A.
90 F 26 094 Shift rod first and second gear a.A. a.A.
0 F 26 098 First and second gear R.L. a.A. a.A.
91 F 26 100 Switch rod third and fourth ga. a.A. a.A.
0 F 26 104 Switch third and fourth. Aisle R.L. a.A. a.A.
94 F 26 106 Shift rod, reverse gear a.A. a.A.
0 F 26 110 Shift rod, reverse gear R.L. a.A. a.A.
0 F 26 112 selector rod a.A. a.A.
0 F 26 118 Switch rod R.L. a.A. a.A.
0 F 26 119 Switch rod R.L. a.A. a.A.
0 D 26 319a Gear lever knob black 4 - gear a.A. a.A.
0 D 27 360 gearshift knob a.A. a.A.
0 D 27 361 gearshift knob a.A. a.A.
0 F 26 128 Button R.L. a.A. a.A.
0 F 26 129 Button R.L. a.A. a.A.
101 D 27 362 Nut a.A. a.A.
0 F 26 130 Lever first and second gear R.L. a.A. a.A.
103 D 26 491 Shift lever on the gearbox (reverse gear) a.A. a.A.
110 F 26 131 Holder, Bowden cable a.A. a.A.
0 F 26 132 Holder, Bowden cable R.L. a.A. a.A.
0 G 46 084 Screw a.A. a.A.